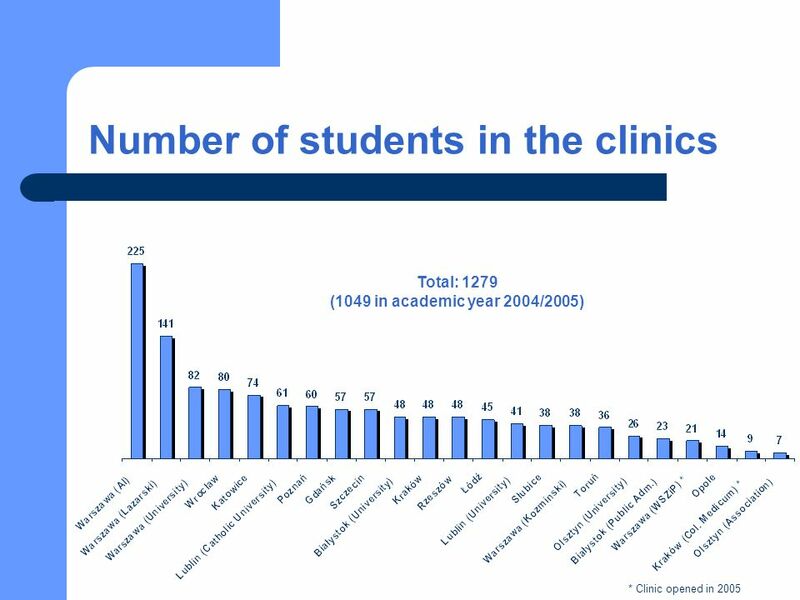 Legal Clinics in Poland Summary of the academic year 2005/2006 activity. 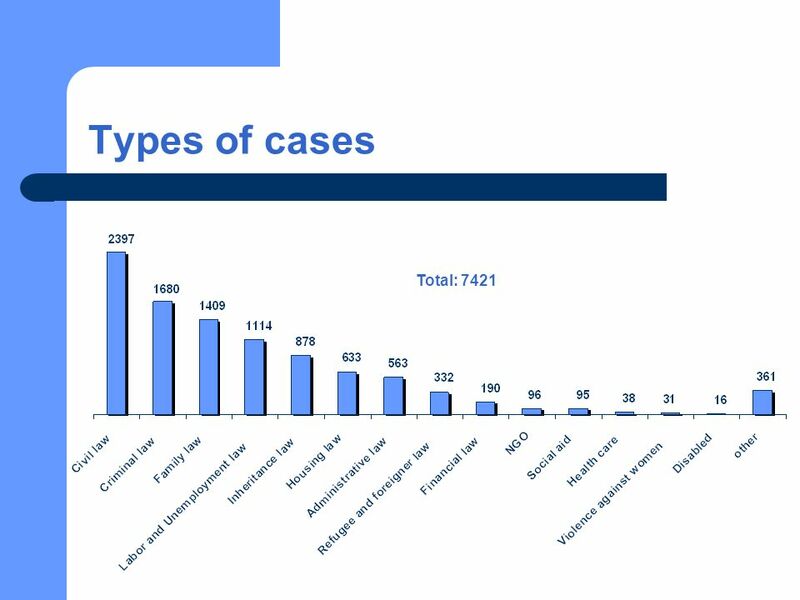 4 Academic year in numbers 9833 cases were submitted to legal clinics between October 2005 and June 2006; 2397 (24%) were civil law cases; 1279 students and 179 teachers worked in the clinics; 1 teacher supervised the work of 7 students; 8 cases were solved by one student. 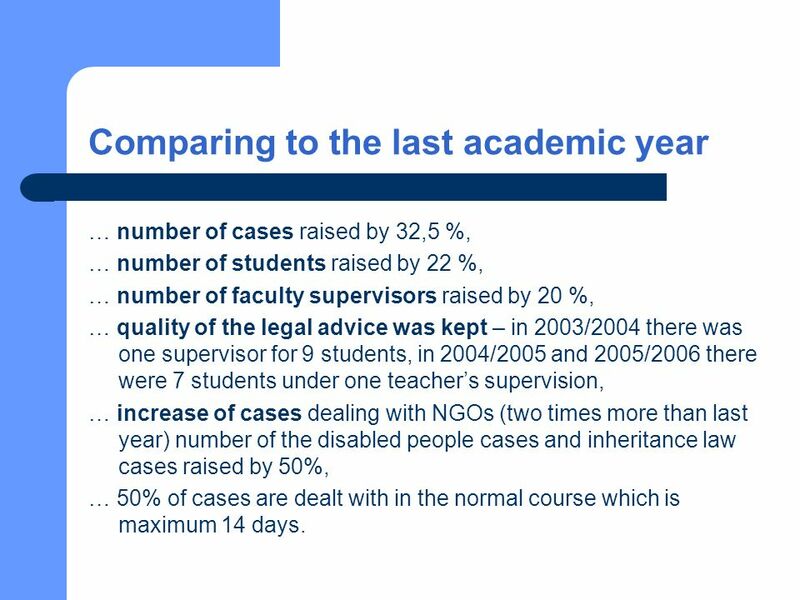 5 Comparing to the last academic year … number of cases raised by 32,5 %, … number of students raised by 22 %, … number of faculty supervisors raised by 20 %, … quality of the legal advice was kept – in 2003/2004 there was one supervisor for 9 students, in 2004/2005 and 2005/2006 there were 7 students under one teachers supervision, … increase of cases dealing with NGOs (two times more than last year) number of the disabled people cases and inheritance law cases raised by 50%, … 50% of cases are dealt with in the normal course which is maximum 14 days. 13 Present status of the legal clinics in Poland There are very few NGO based legal clinics in Poland. 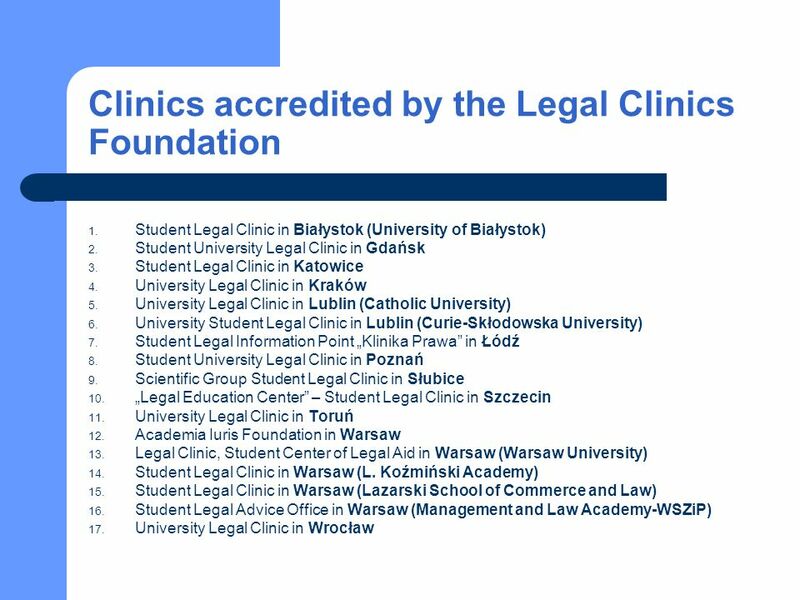 Almost all of the legal clinics in Poland are recognized by the Universities as a part of the legal curriculum at our law schools (as one of the mandatory classes that are offered to the students). 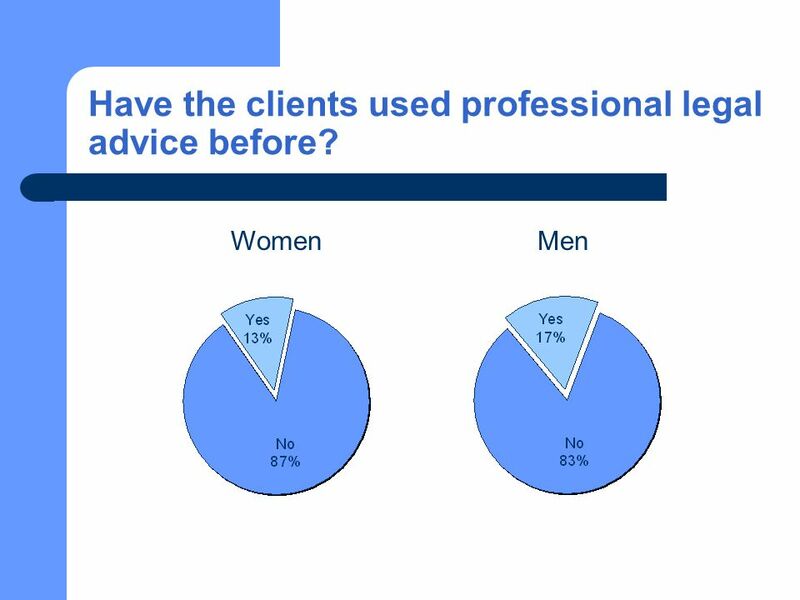 Legal Clinics are present at every state law school and at almost all private law schools. 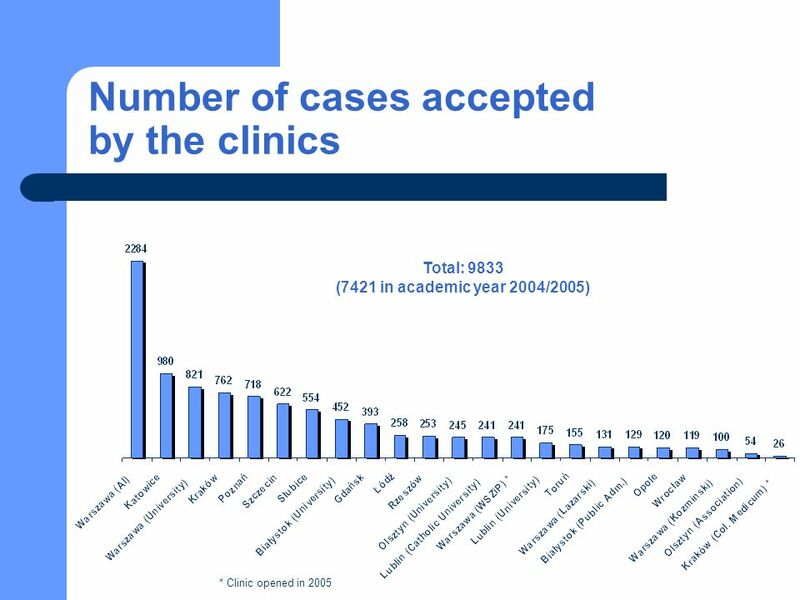 Some of the legal clinics (Krakow, Warsaw, Bialystok, Lodz) gained a status of a chair or laboratory this year All of the legal clinics that are based at the Universities get all the office costs covered as well as the professors salaries paid by the Universities. This year our Foundation and a group of legal aid NGOs with a support of the Ombudsman drafted a new law on access to legal aid. We convinced the Ministry of Justice to include our activity as a part of the national network of institutions that will provide so called pre-trial legal advice and basic legal information to poor people. 14 Cooperation of the Polish Ombudsman with the Legal Clinics network 1. The Ombudsman cooperates with the legal clinics since the very first legal clinics have been established in 1997 and 1998. 2. The cooperation is based on a general agreement signed by the Ombudsman and the Legal Clinics Foundation as well as bilateral agreements signed by 14 different law schools and their legal clinics. 3. 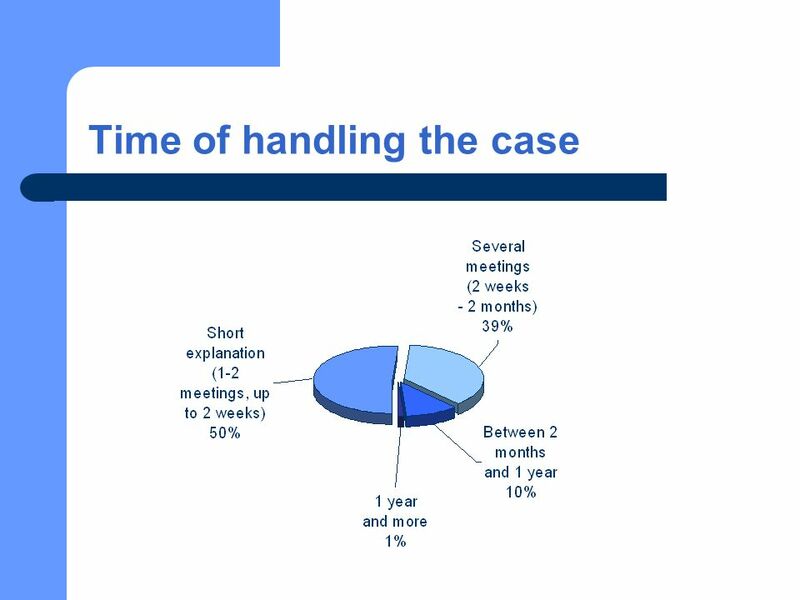 The cooperation with the Ombudsman is based on the following activities: the Ombudsman agreed to take the most difficult cases from legal clinics in order to help the citizens and protect their rights when only it is out of the legal clinics competences, the Ombudsman agreed to admit for traineeship in his office only students from the legal clinics, the Ombudsman agreed to issue and sponsor brochures on legal matters that are prepared by the legal clinics (till now over 50 brochures have been published), the legal clinics submit reports on their activity and describe cases they deal with and based on those the Ombudsman prepares his yearly reports to the Parliament on human rights protection in Poland. 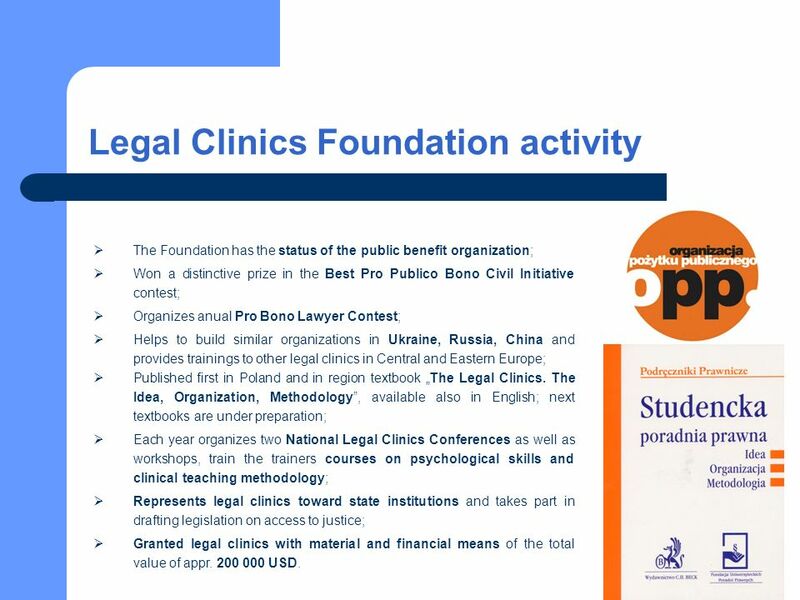 15 Legal Clinics Foundation activity The Foundation has the status of the public benefit organization; Won a distinctive prize in the Best Pro Publico Bono Civil Initiative contest; Organizes anual Pro Bono Lawyer Contest; Helps to build similar organizations in Ukraine, Russia, China and provides trainings to other legal clinics in Central and Eastern Europe; Published first in Poland and in region textbook The Legal Clinics. 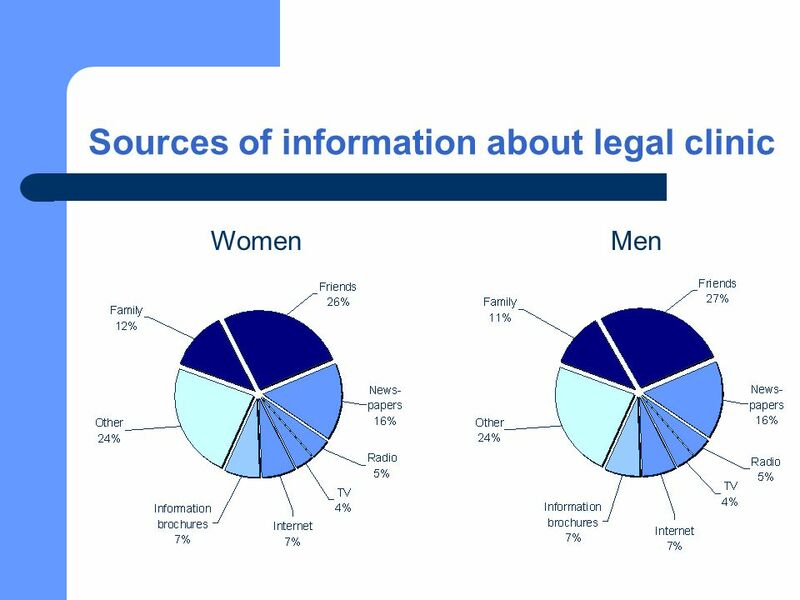 The Idea, Organization, Methodology, available also in English; next textbooks are under preparation; Each year organizes two National Legal Clinics Conferences as well as workshops, train the trainers courses on psychological skills and clinical teaching methodology; Represents legal clinics toward state institutions and takes part in drafting legislation on access to justice; Granted legal clinics with material and financial means of the total value of appr. 200 000 USD. 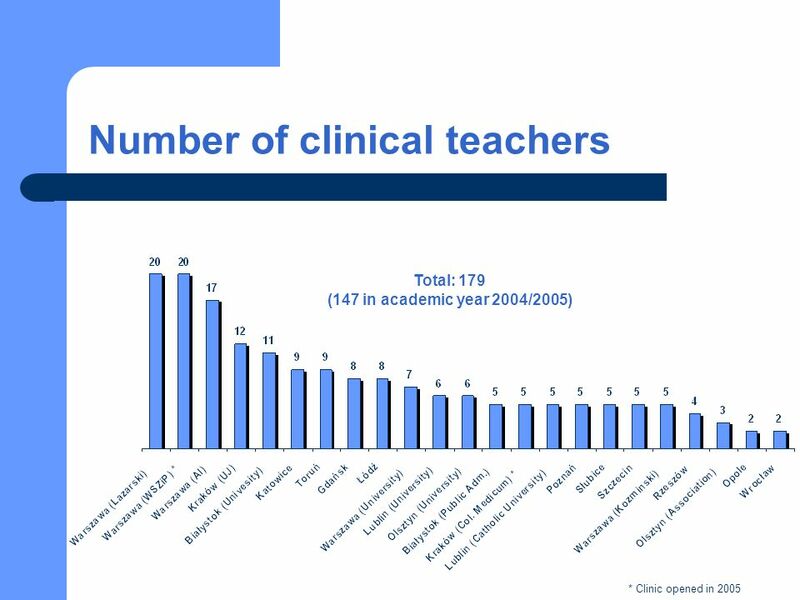 Download ppt "Legal Clinics in Poland Summary of the academic year 2005/2006 activity." PIONIER and its usability for GEANT extension to Eastern Europe Michał Przybylski, CEF Networks Workshop, May 2005. Our Class In class 6a are 27 students. Our teacher is Ms. Agnieszka Folta and she teaches English. Students are years old in our classroom. There. 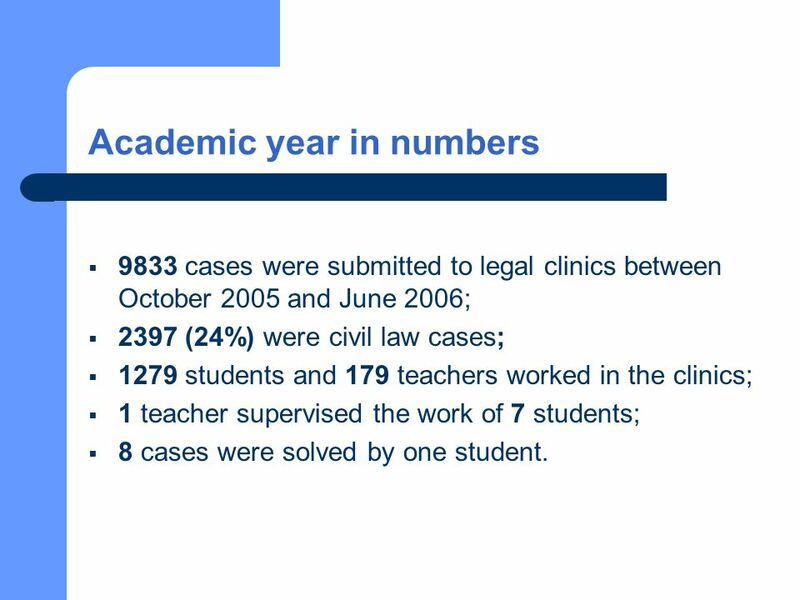 Legal Clinics in Poland Summary of the academic year 2006/2007 activity. Legal Clinics in Poland Basic information on the Polish Legal Clinics Foundation activity. LLP/ERASMUS OFFICE R ome, April 12th 2011. 1 Things that I wish I had known! The ups and downs of the SPAMGO project Tempus IV workshop London, 22 nd February 2008 Sarah OHara Dean of the Faculty. 1 A review of Evaluation and Impact Assessment by DAC Heads of Information in 2006 Ida Mc Donnell Annual Meeting of DAC HoI Canberra May 2006. EURoma meeting September 2013, Sofia How to involve stakeholders for Roma inclusion under the European Code of Conduct on Partnership. BT Wholesale October 2006 www.btwholesale.com 1 Creating your own telephone network WHOLESALE CALLS LINE ASSOCIATED.